This Psalter - a collection of psalms, prayers and hymns, together with a litany of saints - was produced in the late 10th century, probably at one of the Winchester monasteries. Details of its litany of saints suggest it was made for Ramsey Abbey in Huntingdonshire. It is written in Latin on vellum. The text scroll reads "This is the disciple who beareth witness of these things" (John 21:24). 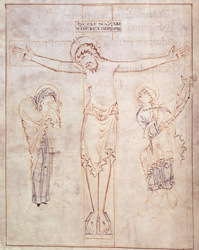 A small group of other 10th-century manuscripts sharing this tinted-outline drawing style are attributed to the same artist, who was influential in introducing the technique into Anglo-Saxon England. At that time, the peace following the long period of Viking invasions enabled a revival of the monastic tradition, which in turn fostered a late flowering of Anglo-Saxon art.